Since arriving in the San Francisco Bay Area, I’ve marveled at how some crawlspaces can be soaked while others are bone dry during the same time of year. I’ve come out of several of them looking like mud man. But, it took getting into one that was bone dry on one side and soaked on the other one to begin to figure it out. I finally got answers to this mystery after inspecting a house that is tearing itself apart! Normal Wet Crawlspace Causes. The causes for wet crawlspaces are surface water runoff and ground water movement. In the Bay Area, this is no exception. What is different is the soil. It’s clay and sand. It’s desert dry in the summer and rain-forest soaked in the winter. First Weird Crawlspace. I remember when I inspected my first house with a crawlspace in the region. I could’ve made pottery out of the mud in there. This house didn’t have surface water runoff problems. The surrounding area was on a broad plateau on top of a hill shared by a whole neighborhood. All the gutters and downspouts were in good repair. But the ground was uniformly soaked. Why? I didn’t have an answer but I’ve been searching for answers ever since. 7 Underground Rivers. I went to a class on enclosing crawlspaces with a bunch of other Home Performance contractors. I was shocked. The instructor and the other students in the class thought I was crazy. However, a like-minded home inspector explained there are 7 underground rivers flowing under Bay Area homes. I didn’t buy it, then and I’m not sure I do now. I can’t figure out who would be crazy enough to build houses in known river beds. The urban legend around here is that it’s true. I’ve yet to confirm it. Second Weird Crawlspace. I inspected a house recently where the house was tearing itself apart. The walls are cracked. The ceiling is cracked. The doors don’t close. The foundation cripple wall leans, and the brick wall is fractured. The place looks like an earthquake hit it, no one bothered to fix it and the homeowner just decided to live with it. This house is on a flat property with a retaining wall in the back and front. In this case, the downspouts at the front of the house empty right at the foundation, but the ones in back drain properly. The termite inspector got into the crawlspace first. He reported a cripple wall, rather than a girder (beam) was supporting the center of the floor. This wall was twisted out of shape. When I looked at the same wall, I discovered it was on a concrete beam, but the wood frame was in direct contact with the dirt. Wood and dirt don’t mix. First, wood absorbs water from dirt, then swells. Besides, termites like it too. In the crawlspace, the soil is uneven. At the front of the house, fill dirt dug out to pour the foundation was not put back, so the area creates a swimming pool. This area is damp, but the back (uphill) side of the crawlspace was dry. It’s reasonable to conclude storm water running off the roof is saturating the soil at the front of the crawlspace, but it doesn’t explain everything. It’s uniformly wet, all the way across. What blew my mind was that the foundation walls were solidly in position. They’re still plumb and square. Expected cracks are missing. First Epiphany. As I lay on my back in the crawlspace pondering the situation with my client, it occurred to me that I’d need to recommend both a geotechnical engineer to investigate the foundation and a structural engineer for the structure. It was then I remembered I was in earthquake territory. I wondered out loud if there is away to get both types of engineers in one person for my client. After all, I’m several disciplines in one. Then it hit me. To put a house back together after an earthquake, companies specializing in both foundations and structures would be essential to put houses back together again. I concluded we needed an earthquake contractor to inspect the house. My client and his Realtor arranged for one to show up in 45 minutes. I crawled out, cleaned myself up, and finished the inspection—just in time for the earthquake guy to show up. I wasn’t going to miss this! Adobe Soil. Our earthquake contractor explained ground water is the issue. Then he told me what I needed to solve this mysterious home condition. What I didn’t know was water impermeable soil is not very far below the surface: 1-2 feet. The soil on top has been broken up to build the house, grow trees, lay pipes, grow gardens, etc. Storm water is absorbed by the clay soil alright. But water doesn’t get to go far before being forced to move sideways. In this case, water flows from the hill in the back toward the street in front. Even though I couldn’t see the hill on the surface, there was a water fall underneath. This is the source of the seasonal moisture causing uneven wetting of the crawlspace. The concrete beam in the center of the crawlspace is rising and falling with the seasons. To make matters worse, the wood cripple wall is seasonally swelling and drying too. Hence, the house is seasonally tearing itself apart continuously, all day, every day, 24×7. Solution. To protect this house, water flowing down the waterfall (adobe-soil hill) needs to be diverted. The proposed solution is a French drain, carved into the rock-hard soil at the back of the house. Lessons for Bay Area Homeowners. Now that I understand the problem, I have a few recommendations. Don’t’ assume the adobe soil under the house is as flat as the soil on top. Put the drain in only after consulting with a geotechnical engineer to ensure the foundation will rise and fall evenly with the seasons—like it’s supposed too! Be sure to divert roof water runoff away from the foundation. Many use buried drains in the Bay Area. Consult with engineers with earthquake companies to solve both structural and foundation concerns. Thankfully, most wet crawlspace problems are easier to explain. It’s best to deal with surface water and ground water by conventional means by using obvious solutions first. You’ll need them regardless of whether something more complicated is going on. 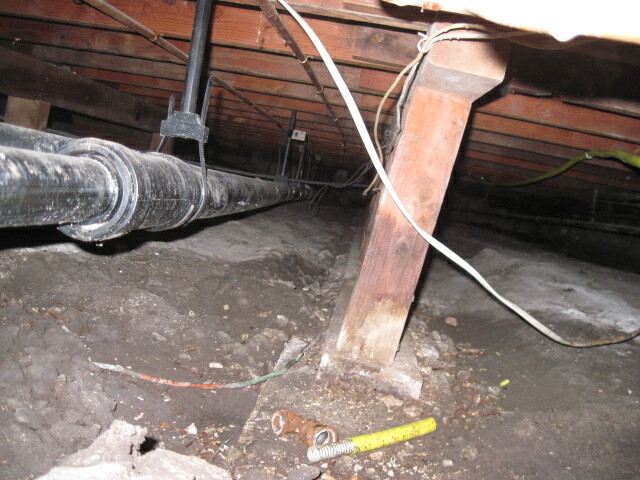 Check out our blog post from the Common Complaint series: Damp Crawlspaces. I think someone knew I needed that information for a house I inspected 1.5 hours later. This house was suffering from high moisture conditions and the homeowner was concerned about possible mold. About those 7 underground rivers: I’ll still keep looking into them too. In the meantime, if you find your house built in a previous river bed, DON’T MAKE YOUR HOME THERE!